Galley Wench Tales: Heave Ho! Out She Goes! to make room for the fuel tank to come out. We bought our Pearson 365 ketch for her reputation for safety as a solid blue water boat - our primary selection criteria. Seems most of the 400 or so built back in the 1970s era are still around, which speaks volumes to us. 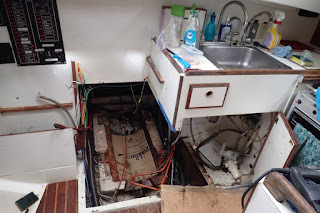 Designed as a cruising boat built specifically with a couple in mind, other excellent Pearson features include lots of storage, and for its size, both a well-laid-out galley and a bathroom with a separate shower (versus showering your toilet while showering yourself). A bonus on our particular Pearson is she spent all but the last six or so years in fresh water, minimizing wear and tear. There was and engine in the gaping open hole. is a model of efficiency. Thanks to all those years in fresh water, certain maintenance projects were justifiably delayed. Wayne believes we're one of the few Pearson owners who'd yet to replace our fuel tank. All boats are compromises and now for us it's payback time. When Pearson 365s were built, the fuel tank was placed then the cockpit floor was placed on top of it and sealed. There are only two ways to remove it. 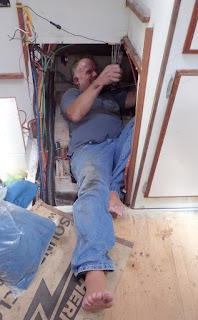 Pull the engine out of its very tight enclosure below the companionway stairs in the cabin, the up through the cabin, out the companionway door, into the the cockpit then off the boat. Saw the fuel tank into pieces small enough to remove then replacing it with two smaller fuel tanks. Both methods are both viable, and awful. Wayne wanted the freedom to work more freely on the engine by taking it out and because he preferred to stick with a single, larger fuel tank*. 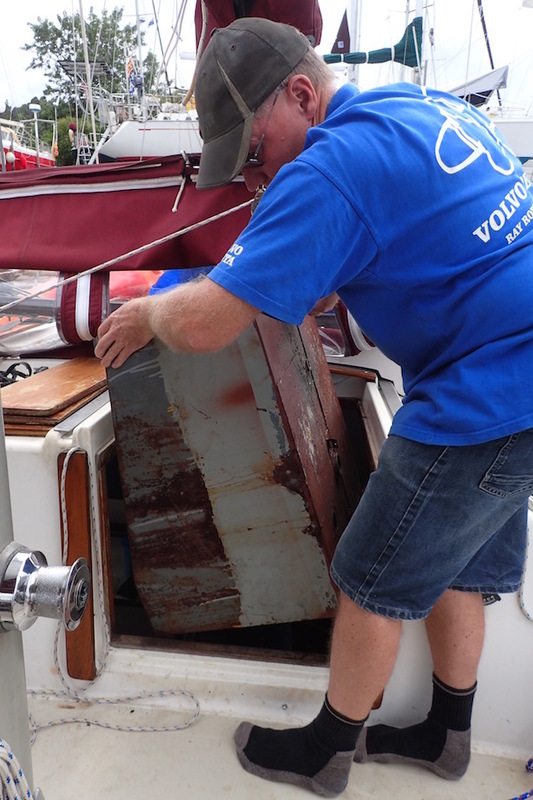 He chose #1, through, out, up and over the companionway. *keeps fuel tank capacity at 50 gallons, versus 40 gallons for two separate, smaller tanks. Fuel tank in Journey's cockpit. Did I mention the space the engine and then the fuel tank come out of is tight? Really, really tight. In our case that meant dismantling a few items Wayne generously let me claim as galley territory. That was enough to get the engine out. To make enough room to remove the fuel tank, Wayne then had to saw through part of the galley cabinetry, essentially hacking off the lower portion of the the cabinet adjacent the engine "bay." Wisely, Wayne suggested we not live-aboard whilst this boat surgery commenced. Smart man. Temporarily moving out spared us the insanity of living amidst a swirl of deconstruction, sawdust and grease, scattered tools and other general disarray. 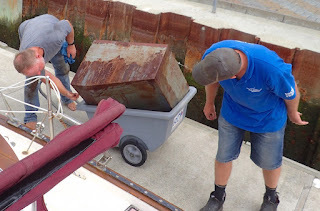 Not only that, our temporary digs double as a storage space for emptying the boat of its ample lazarette storage areas, which when open provide additional thoroughfares to access various critical boat systems. began to leak. Reinforcement for its removal and replacement. In the last week, Wayne's pulled out the engine and today the fuel tank. Upon a clear gander after its removal. the fuel tank showed signs of small initial fuel leaks, reinforcing why this work is critical. It will be replaced with a new, robust aluminum tank. I don't even know the list Wayne's developed since pulling the engine out and getting a good look at it. I do know his confidence in our engine and its future maintenance will be vastly improved once its done. Definitely on the list ? 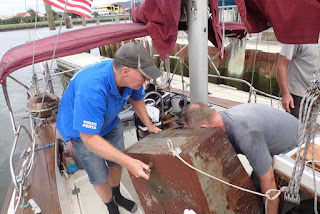 Fixing small oil leaks (classic Westerbeke issues) and other stuff while he's at it. He's also going to put in a drip pan so future dribbles will be easy to spot, assess and clean up and they won't find their way into the bilge and ocean. We've got a long way to go before Journey's ready to splash, but when that days comes it will be full of sweet relief. Mt. Parahaka, Whangarei, overlooking Whangarei Town Basin Marina where we were) and Riverside Marina where we are now, working on our Pearson 365 sailboat. Eventually I'll get Wayne up here to enjoy the view! After our near month long road trip blitzing New Zealand from Northlands to its Southernmost mainland tip, at Bluff, South Island, we're back. Currently we're in Whangarei’s Riverside Marina (S35.43.674 E174.20.17), doing some much needed boat work before we resume cruising, when we're not running around town for boat work errands or enjoying the novelty of an apartment with a spacious kitchen with a microwave and proper stand-up fridge-freezer, hot, leisurely showers. and - miracle of miracles - a queen-sized bed.